Day three of the gratitude challenge is about being grateful for a family member. For me, it would have to be my Great Grandfather, a man who epitomises the term ‘gentleman’ and whom I feel blessed to have had such a close relationship with over the course of my life. 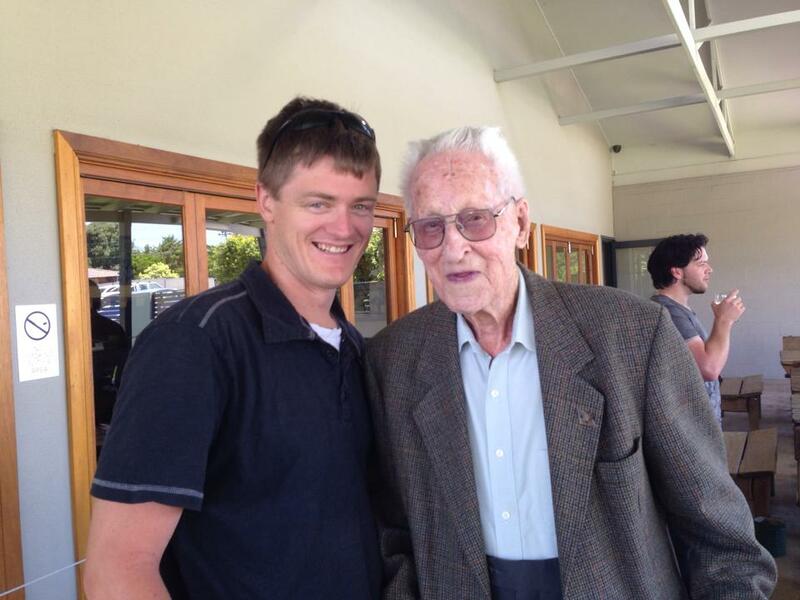 The photo below is from my birthday celebrations in 2013, when at the grand age of one hundred and five, he still came out for lunch with the family. Grandpa is a man of great humility and also great mischievousness, with a great sense of humour. He served in Darwin during World War Two, and then worked for Gordon and Gotch, a publishing firm, beginning as a travelling sales representative, where he would take the train out of Sydney on Monday morning, travelling up the coast line to Port Macquarie, then inland covering Armidale, Tamworth and other regional locales before returning to Sydney on the Saturday; and finishing his career with them as the head of the Australian offices. He has now been retired for longer than he worked. I think my sense of humour and my appreciation for ‘old world’ mannerisms comes from him. Spending time each week with him as a child, particularly once we returned to Tamworth, and seeing him potter about in his three-piece suit (oh, he would take the jacket off to do his gardening if it was hot), and sharing afternoon tea with him in exchange for me taking the garbage bins to the curb on collection day are prized memories of my childhood. I, alone of my generation in my family, have experienced Grandpa will full control of his faculties. I will never forget him telling me to speed up when he took me for a driving lesson once we left town as he liked the feeling of going quick sometimes. I wish that I had thought to sit and record our conversations years ago for the benefit of others who have not had the opportunity to hear the memories of his life. He saw West Side Story in the original showing in the USA, and gave me his copy of the program from that night, with his ticket stub inside it a few years ago.. I think my love of three-piece suits, which I rarely get to express, definitely comes from him. He is very firmly ‘blamed’ as the source of our whole families love of dessert, often being heard saying that dinner is incomplete without it. For his one hundredth birthday, he of course received the letter from the Queen which still stands on his shelf. When Mrs C21stT and I were planning our wedding I told her that she could have anything she wanted, and that all I wanted was for Grandpa to be there, and accordingly we held the wedding in my hometown of Tamworth. Grandpa was excited, telling the staff in the Aged Care Facility in which he resides that he needed to look good for the day, and he made it. He was energetic, looked suave as always, was able to see and hear everything, pulled himself upright for the photo below and looked quite pleased with everything. That is a memory that I will cherish for the rest of my life, having a man whom I have looked up to for so long, able to attend in person, still in charge of his faculties, my wedding at the grand age of one hundred and one hundred and three. I have a deep love and respect for Grandpa, and with his one hundred and seventh birthday looming in little over a month, I am immensely grateful for his presence in my life and the influence that he has had on who I a am. As a side note, I put together the below list for his one hundred and third birthday and posted it to my Facebook wall. I copy it here as it still boggles my mind how much he has lived through. 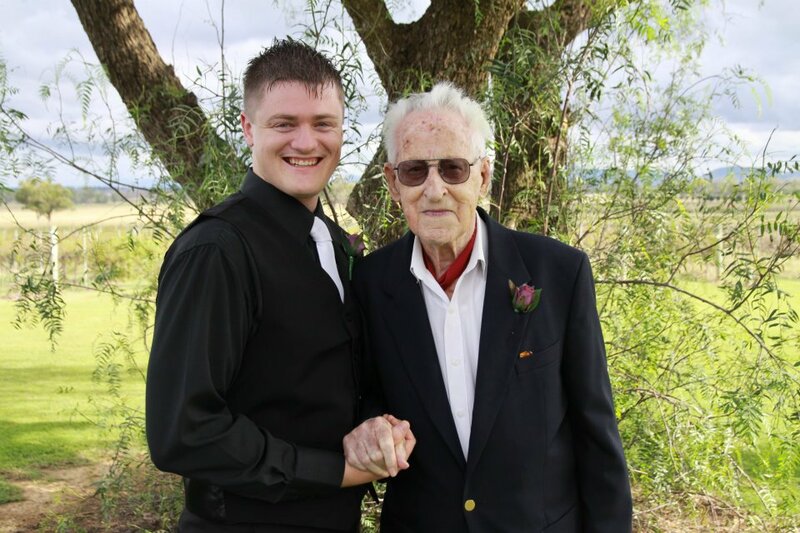 Bumping this up again as another year roles around and Grandpa turns 103 on Friday…. Some of this stuff might seem like ‘yeah whatever’, but this is all stuff Grandpa would have grown up and seen going on around him. Stuff I learned in history class, or from textbooks and docos. That boggles my mind, it really does. He was born 16th September, 1908. There are currently six living former prime ministers: Gough Whitlam, Malcolm Fraser, Bob Hawke, Paul Keating, John Howard and Kevin Rudd.The oldest of these is Gough Whitlam, who is 94. On 22 January 2009, Whitlam achieved a greater age than any other person who was Prime Minister of Australia. At 52, Kevin Rudd is the youngest former prime minister. Plus, there have been EIGHT Catholic Popes during Grandpas life. August 20 – The Great White Fleet, the first visit by the U.S. Navy to Australia, arrives in Sydney. September 27th – The Model T Ford was built for the first time. The 1908 FA Charity Shield was the first Charity Shield, a football match contested by the winners of the previous season’s Football League and Southern League competitions. The match was played on 27 April 1908 between 1907–08 Football League winners Manchester United and 1907–08 Southern League champions Queens Park Rangers. The match was played at the neutral venue of Stamford Bridge, London, and ended as a 1–1 draw, goals coming from Billy Meredith for Manchester United and F. Cannon for Queens Park Rangers. Since extra time was not played, and penalty shoot-outs did not exist in the early 1900s, the match went to a replay, also at Stamford Bridge. The replay was played four months after the original match, on 29 August 1908, and finished in a 4–0 victory for Manchester United, crowning them as the first ever Charity Shield winners. Jimmy Turnbull scored a hat-trick for United, the other goal coming from George Wall. The 1908 Charity Shield raised £1,275 for charity and is the only Charity or Community Shield to date to have required a replay. 1910: George V becomes King of the United Kingdom and the British Dominions and Emperor of India. 1914: Beginning of World War I. Panama Canal opens. 1918: End of World War I; Spanish flu pandemic. 1919: Treaty of Versailles. League of Nations founded in Paris. Polish-Soviet War begins. The Italian Fascist Party is established by Benito Mussolini. First experimental evidence for the General theory of relativity obtained. 1922: Howard Carter discovers Tutankhamen’s tomb. The Irish Civil War begins. The Union of Soviet Socialist Republics (USSR) is formed . 1923: Time Magazine is first published. The Walt Disney Company is founded. 1924: Death of Vladimir Lenin. FBI founded under J. Edgar Hoover. 1925: Benito Mussolini gains dictatorial powers in Italy. Mein Kampf is published. 1927: The Jazz Singer, the first “talkie”, is released. Joseph Stalin becomes leader of the Soviet Union. World population reaches 2 billion. Australian Parliament convenes in Canberra for the first time. The BBC is granted a Royal Charter. 1929: Wall Street crash of 1929 and the beginning of the Great Depression. The first Academy Awards are presented. 1931:Construction of the Empire State Building. The Star-Spangled Banner is adopted as the United States’s national anthem. 1936: Hoover Dam is completed. 1939: Nazi invasion of Poland triggers the beginning of World War II in Europe. 1940: Nazis invade France, the Netherlands, Denmark and Norway. Katyn massacre in Poland. Winston Churchill becomes Prime Minister of the United Kingdom. Battle of Britain as the British Empire fights alone against the Axis Powers. The Blitz begins. 1962: Cuban missile crisis, The Beatles’ first record. 1972: Northern Ireland’s Bloody Sunday. 1979:Margaret Thatcher becomes Prime Minister of the United Kingdom. Implementation of China’s One child policy. 2010 eruption of Eyjafjallajökull – A massive ash cloud is formed by the eruption of the Icelandic volcano Eyjafjallajökull, on April 14, 2010 grounding flights across northwest Europe. Scientists began recording volcanic activity there in 2009 which increased through March 2010 culminating in the second phase eruption in April. 2011 Queensland floods – Began in December 2010 primarily in Queensland. The flood cause thousands of people to evacuate. At least 200,000 people were affected by the flood. The flood continued throughout January 2011 in Queensland, and the estimated reduction in Australia’s GDP is about A$30 billion. February 2011 Christchurch earthquake – New Zealand’s prime minister says 181 people have died after a 6.3-magnitude earthquake hit Christchurch on February 22, 2011, making it New Zealand’s second-deadliest natural disaster after the 1931 Hawke’s Bay earthquake. 2011 Tōhoku earthquake and tsunami – On March 11, 2011, a catastrophic undersea earthquake of magnitude 9.0 occurred offshore of eastern Japan, the greatest in the country’s history and created a massive tsunami which killed over 15,000; it also triggered the Fukushima I nuclear accidents. The overall cost for the earthquake, tsunami and nuclear accidents could reach $300 billion, making it the costliest natural disaster on record. April 25–28, 2011 tornado outbreak – Regarded as the deadliest tornado outbreak ever recorded and dubbed the 2011 Super Outbreak, a catastrophic tornado outbreak from April 25 to the 28th affected the Southern United States and killed over 330 people, most coming from Alabama. Damages are expected to be near or over $10 billion. 2011 – The Leader of Al Qaeada, Osama Bin Laden, who was responsible for the development of the plans for the September 11th attacks is killed in a raid on his compound in Abbottabad, Pakistan by Seal Team 6 of U.S military Special Forces on the evening of May 1, 2011. 2011 – The shutdown of the largest UK tabloid, “News of the World”, after 168 years in print due to the 2009 phone hacking scandal. 2011 – Completion of the Harry Potter film series, which is currently the world’s highest grossing film series. Most of this is stuff I learned about in History classes or old textbooks. Grandpa was alive for it all. And up until a few years ago, had a collection of front pages from newspapers of a lot of these events. Grandpa has lived through it all. The wars, the Great Depression, the start of the common use of cars, the space age, the nuclear race, TV, records to tapes to CDs to DVDs…this list is just stuff I thought was interesting. A loaf of Bread in 1911 was 2.4cents, 2kgs of sugar, 9.7cents, a dozen eggs were 12.1 cents, a 1kg leg of lamb was 8.6cents, while a 1kg leg of pork was 11.2 cents. Jump forward to 1965, during the “Golden Years”. A loaf of Bread was 15.7 cents, 2kgs of sugar, 41.8cents, a dozen eggs were 60.2cents, a 1kg leg of lamb was 65.7cents, while a 1kg leg of pork was 136.5 cents. Jump now to 1990. A loaf of Bread was 131.3 cents, 2kgs of sugar 237.8cents, a dozen eggs were 238.8cents, a 1kg leg of lamb was 488.5cents, while a 1kg lef of pork was 689.8 cents. Now think about how much you pay for those down at your local cornerstore. I haven’t updated this to reflect events since this list was originally posted on Facebook. Posted on August 15, 2015 August 15, 2015 by Brendan MitchellPosted in Gratitude ChallengeTagged family, Grandpa, Gratitude.